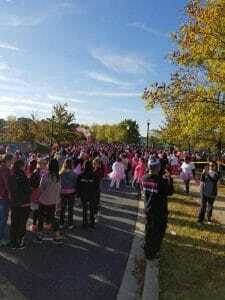 Since 2006, the HAI Steppers of Humphrey Management have raised money to support the Making Strides Against Breast Cancer Walk sponsored by the Maryland Chapter of the American Cancer Society. 1 in 8 women will be diagnosed with breast cancer and it is the 2nd leading cause of death in women. The American Cancer Society not only funds research, it widely disseminates breast cancer awareness information, and funds mammograms & supportive services to cancer patients. Breast cancer has directly affected the lives of so many and this year, HAI lost one of our own. Beloved long-time team member, Yvonne Brown, Porter, Evergreen Apartments passed away after a courageous battle. 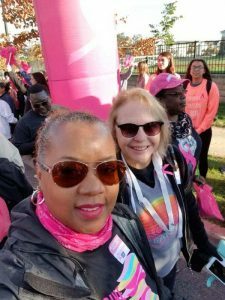 After participating in Avon’s The Walk to End Breast Cancer 39 mile walk, Payroll/Benefits Manager and HAI Steppers Team Leader, Kelly Robinson, took up this important cause. Through a variety of fun raffles at annual conferences, company-wide picnics, $5 Jean days, wacky Think Pink activities and employee fundraisers, the HAI Steppers have collectively raised over $65,000. “Increasing breast cancer awareness and fundraising have been year-round at Humphrey Management. We are thankful for the commitment and generous spirit of our fearless Team Leader, Kelly Robinson and the HAI Steppers.” said President, Bethany Hooper. This year, on a chilly morning in October, members of the HAI Steppers team showed their support for the charitable organization by braving the cold and making strides toward a world with more birthdays!